Enjoy your DIY talent in your spare time.As a gift for yourself,children,parents and others is the best choice. 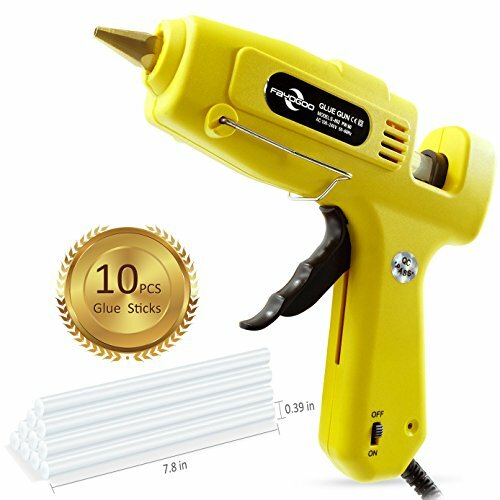 This full size heavy duty glue gun (big) can be widely used in the process of production, assembly and packaging of industrial enterprises. Because it is a high safety tool, it is suitable for schools, companies, outdoor workers and so on. 1.Before plugging in, look over the body of this glue gun to check if there is any indications of damage. Make sure the electrical cord has no any frayed or broken wires. 2.Insert the glue stick into the hole at the back of this large glue gun,slide it in until it stops by pull the trigger. 3.Plug in the glue gun,turn on the power, preheating the glue gun for about 5 minutes to soften the glue stick. Once it's been sufficiently melted, pull the trigger, the glue will ooze out. 4.Aim the nozzle of the glue gun downwards and place it close the item you'll be gluing. Gently squeeze the trigger of the gun until melted glue begins to emerge from the nozzle. 5.Rest the glue gun on the wire support stand at its base when it's not in use. Never lay an active glue gun on its side. Turn off the power to avoid glue leaking when the glue gun stop working more than 15 minutes. 6.Make sure to keep the nozzle directed away from your skin at all times, and don't touch any of the glue until it has cooled (this should take about a minute). 7.Don't pull out of the remaining glue sticks from glue gun after each time using. Finish that stick before inserting a new one. Or Just insert a new one to push the remaining short stick. 8.Don't disassemble this glue gun in any case and Avoid use it under humid condition. NO clean-up is required for the nozzle. 1. 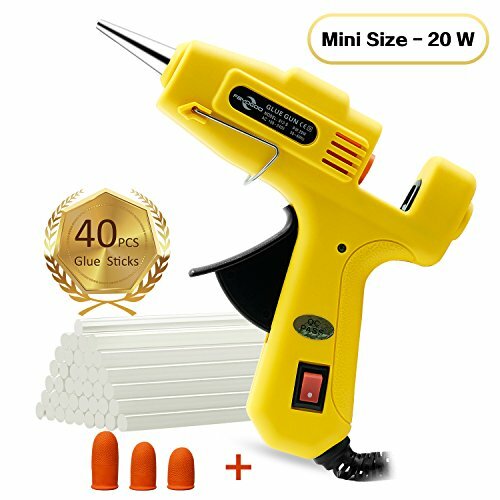 Heavy Duty High Temperature glue gun or Mini Hot Glue Gun. Power: 20 / 60 / 100W. 2. Easy to use: simply insert the glue stick into the hole at the back of the hot melt glue gun, slide it in until it stops by pull the trigger. Turn on the power, preheating the big glue gun for about 5 minutes to soften the glue stick. Once it's been sufficiently melted, pull the trigger, the glue will ooze out. 3. 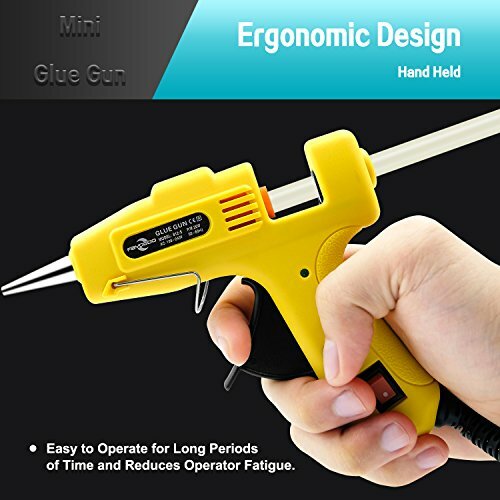 The modern,efficient,light-weight design of this crafting glue gun makes it easy to operate for long periods of time and reduces operator fatigue. And it adheres well to plastics, light metals/glass, paper, PVC, polystyrene, acrylic, fabric and wood. Great for packaging, bonding cardboard, product assembly, upholstery,etc. 4. 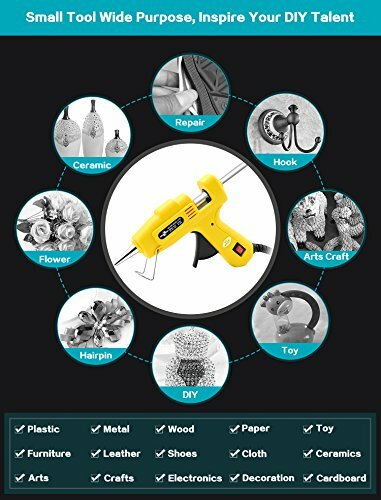 This full size hot glue gun is not only for Home Office School Arts & Crafts Use. With the dual temperature, it is ideal for industrial or heavy-duty applications. 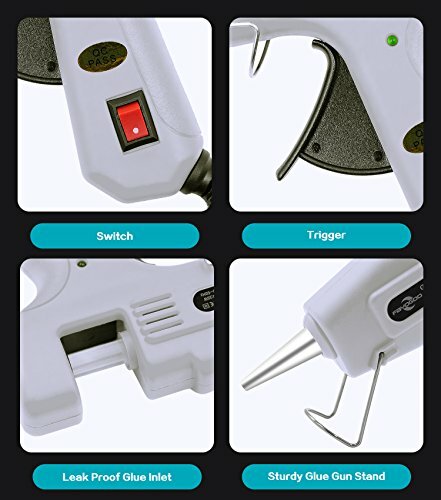 You could also choose Fayogoo Mini Glue Gun for small DIY. Whatever your project needs, we has a temperature option that's right for you that practical on an wider variety of applications. 5. Warm tips: Don't touch any of the glue until it has cooled. Children may only allowed to use the large glue gun under adult supervision. [A full year guarantee]: if you are not 100% satisfied with your purchase for any reason, just let us know, we will fix it, we are here to make sure that you are satisfied!